A stylish and high-value Chicron textile glove with spandex to optimize fit in the thumbs and fingers. Welded TPR panels strategically positioned in the knuckles and top of hand help increase protection. The DX-3 is available in men's, women's and youth sizes. 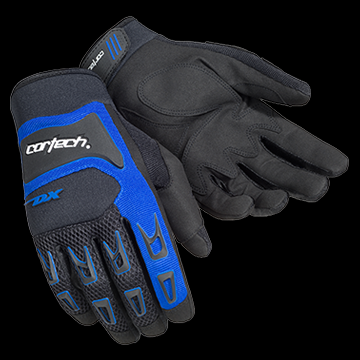 This glove provides excellent abrasion-resistance without sacrificing bar feel and control. • Chicron 0.8mm palm construction provides excellent abrasion-resistance without sacrificing bar feel and control. • Increased airflow provided by open air-mesh fabric in the middle, ring, and pinky fingers. • Stretch spandex fourchettes improve comfort and dexterity. • Strategically positioned welded TPR knuckles and top of hand protectors. • 2.0mm neoprene cuff and knuckles for a comfortable form fit and protection. • Chicron 0.8mm overlays in the palm, heel, and thumb for added protection. • Stretch Elastane material fourchettes increase comfort and finger dexterity.